Camino Cielo Echo, the Tom Rainey Trio's second effort, features the same group as the debut album, Pool School, however in the intervening time, it seems the group has further developed a sound that is as improvization based as ever, but even more elastic and risk taking. 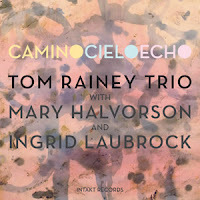 As before, the group is Tom Rainey on drums, Ingrid Laubrock on sax and Mary Halvorson on guitar. The first song is collection of small interactions and motifs. 'Expectations of Exceptions' begins quietly, expectantly, with Laubrock laying down a fluttering expanse of tones. Halvorson's guitar rings out with unique dissonant chords, while Rainey pulls them together with a pulse that weaves in and out of time, skipping beats and creating a complex foundation for the players. 'Mullet Toss' comes bursting from the speakers in a hail of distorted guitar and explosive sax work, while Rainey pours on some dramatic percussion. Then, about half way through, the saxophone transitions the song into a more subdued but still tense state. 'Mr. and Mrs. Mundane' is anything but. Starting with a rather straight ahead sax solo over the drum, the guitar soon joins with some quietly slashing chords. Gradually, the song begins to chase itself around, the guitar scattering notes and the sax both following and leading the proceedings while Rainey pushes and pulls. The title track just hovers, Laubrock's languid lines suspended in Halvorson's unusual chord voicings. Rainey provides texture below the textures, faint sounds that grow stronger as the song progresses, yet always holding back, just floating. This is then juxtaposed against the crunch of distortion of the next tune. Overall, there is a lot going on in these vignettes. Whether they're aggressive, or quiet, or a little of each, the songs grow organically and spontaneously. The three musician's have played together now over the course of these albums, as well as in several other configurations and they have developed great synergy and sympathy -- one could almost say telepathy -- in their interactions.